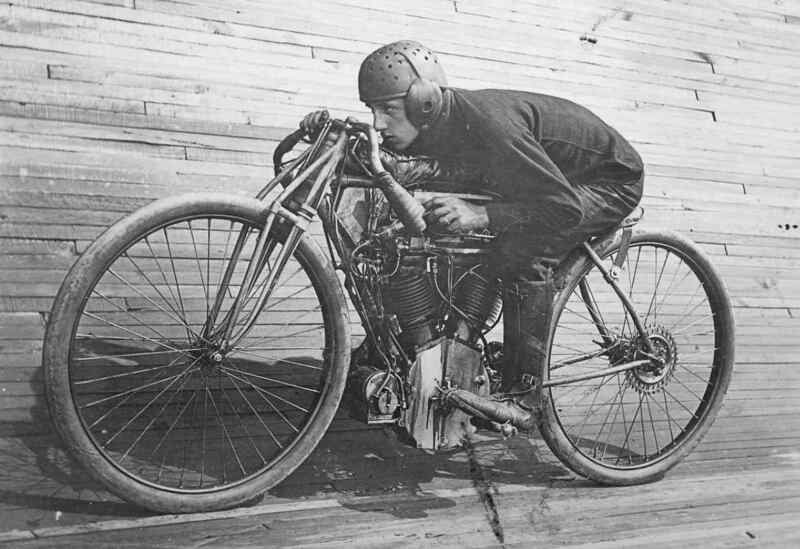 If you are an avid antique motorcycle fan, you’ve likely heard of the popular motorsport, Board Track Racing. Prevalent in the U.S. during the 1910s and 1920s, this event was a competition that took place on circular or oval race courses with surfaces composed of wooden planks. The reason for the use of these board tracks were in part because they were not expensive to construct. Unfortunately, they did lack durability, and because of this they required a great deal of maintenance to remain in use. Most tracks only lasted for three years before being abandoned. Due to the lack of safely built tracks, called motordromes, the sport of Board Track Racing was a risky one. Riders were able to reach speeds of more than 100 miles an hour, meaning that when a crash happened, it was devastating. Crashes weren’t rare either; riders who went down faced being pelted with splinters from the boards and often times spectators were injured as well. Some crashes were even fatal. Despite all this, people flocked to the races at board tracks from Denver, to Milwaukee, to Long Island. By the mid-1920s, however, the novelty of the sport began to wear off and it was losing its appeal. Newspapers had begun to refer to motordromes as “murderdromes,” and local governments even starting closing some of the tracks. Race officials and the motorcycle manufacturers that sponsored racing teams tried to implement safety measures, but it didn’t help. By the early 1930s, Board Track Racing became obsolete. At Condon Skelly, we appreciate the history behind antique and classic motorcycles, trucks, and cars. Since 1967, we’ve been helping our customers protect their classics with affordable, industry-leading insurance coverage. We’re a group of collectors, enthusiasts, and professionals who specialize in insuring all types of collector vehicles. Please contact us today to learn more at 800.257.9496. This entry was posted in Classic Motorcycle Insurance, Collector Car Insurance and tagged classic motorcycle, classic motorcycles, collector cars, collector motorcycle, Insurance. Bookmark the permalink.